I’m glad that title didn’t scare too many of you off! This weekend in DC was like a microcosm of the month of March itself: sometimes rainy and cold, sometimes sunny and warm. It doesn’t know what it wants to do. But it was sunny enough on Saturday that we were out and about running errands, and then rainy and cold enough on Sunday that this delicious Alsatian stew was just the thing to warm us up. What is Bacheofe? 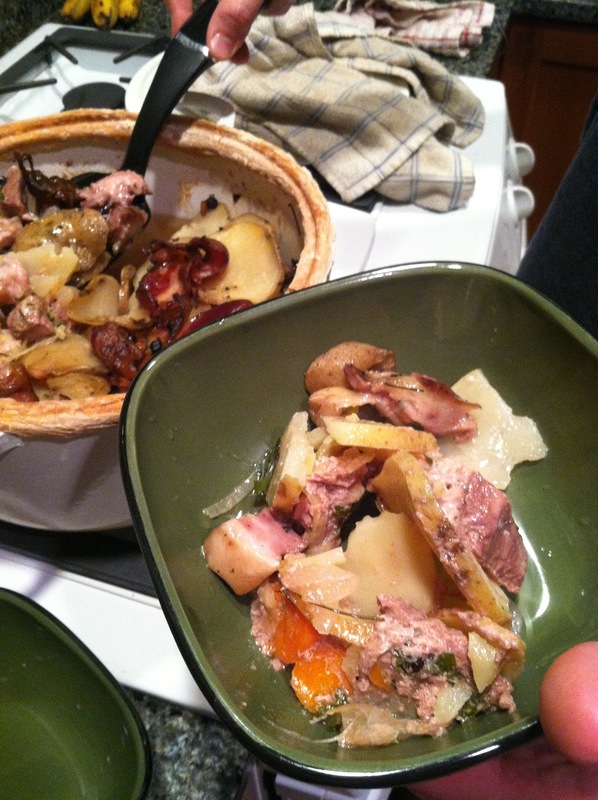 Also spelled baeckeoffe, backenoff, or baekaoffa, it’s a wine-simmered Alsatian stew with meat and vegetables interwoven with potatoes. 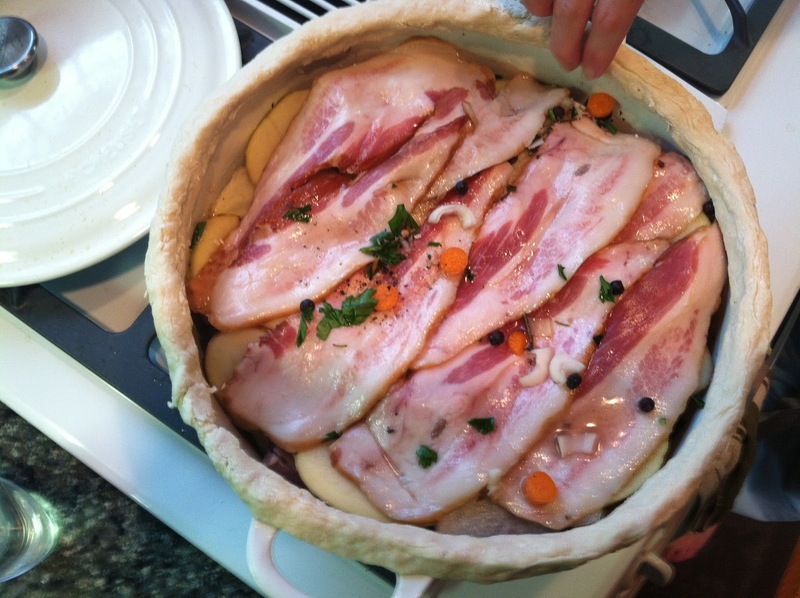 The name means “baker’s oven,” because (according to Larousse Gastronomique), housewives would assemble the stews on Monday morning and drop them off at the bakery to cook in the residual heat of the ovens to be retrieved in the afternoon. 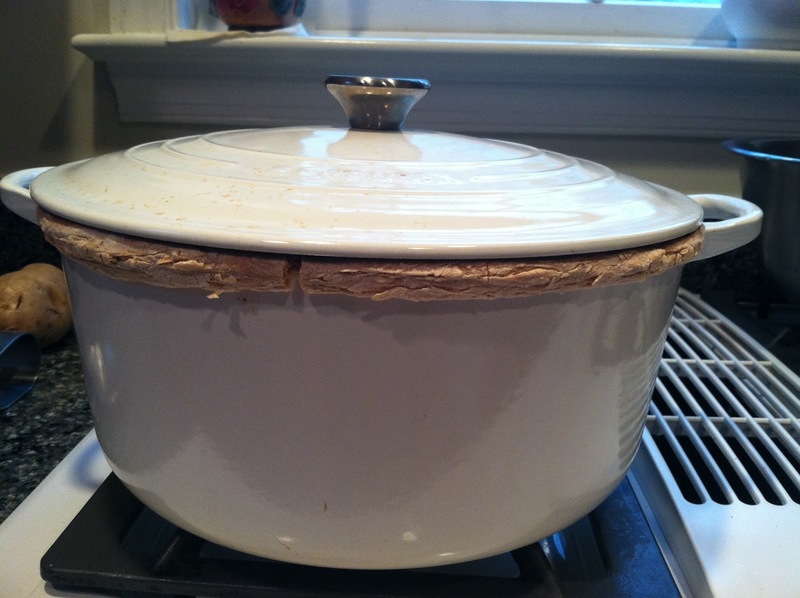 The neat thing about bacheofe is the thin rope of dough around the rim that seals the top to the dutch oven. 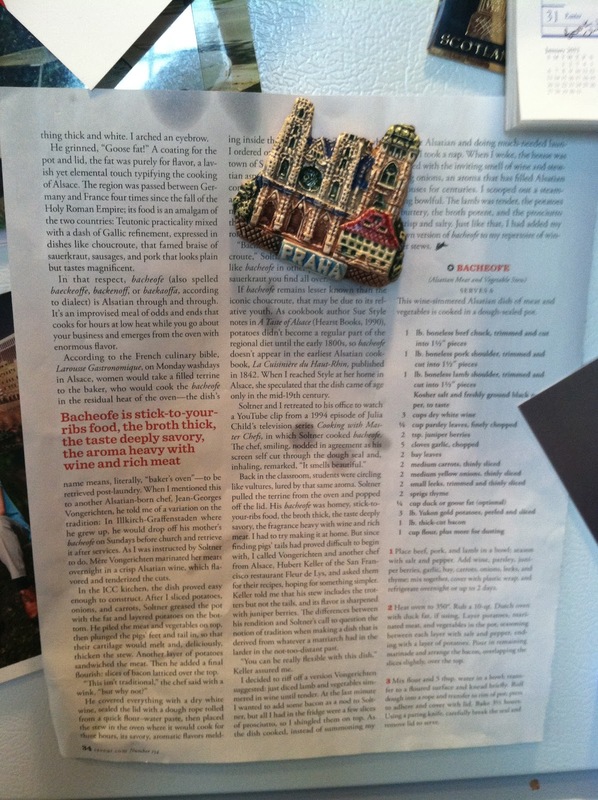 I came across bacheofe in Saveur magazine, hence the title “a la Saveur.” The author’s version includes a bacon lattice on top, which I couldn’t resist. 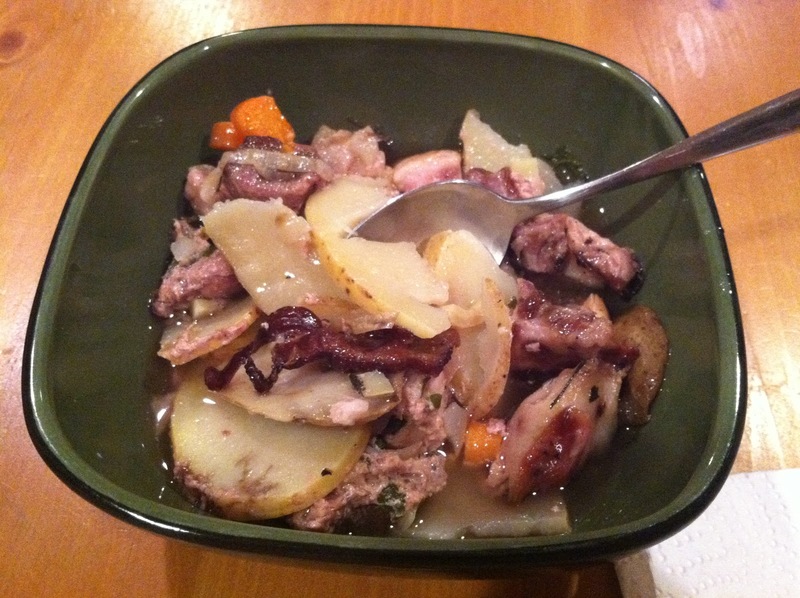 You can find the recipe here: http://www.saveur.com/article/Recipes/Bacheofe-Alsatian-Stew. It takes two days, so plan accordingly. 1. 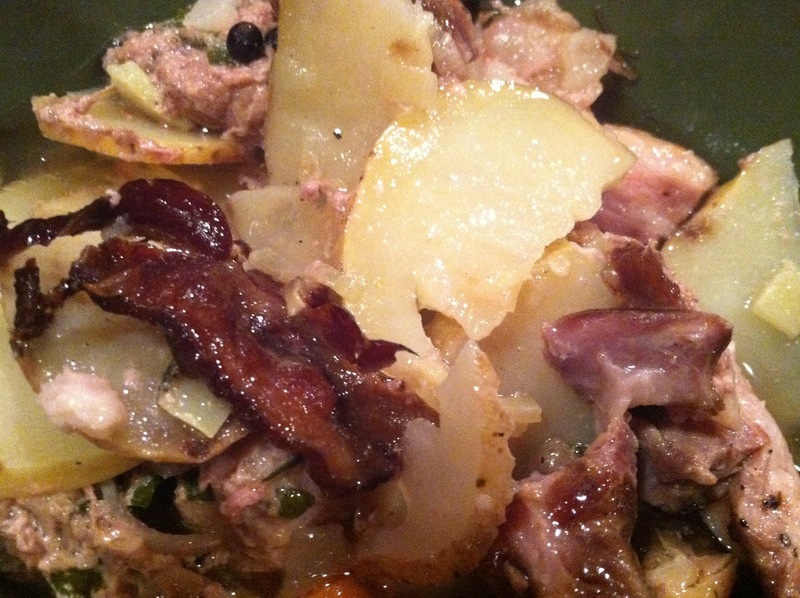 Place beef, pork and lamb in a bowl (I used a large glass baking dish) and season with salt and pepper. 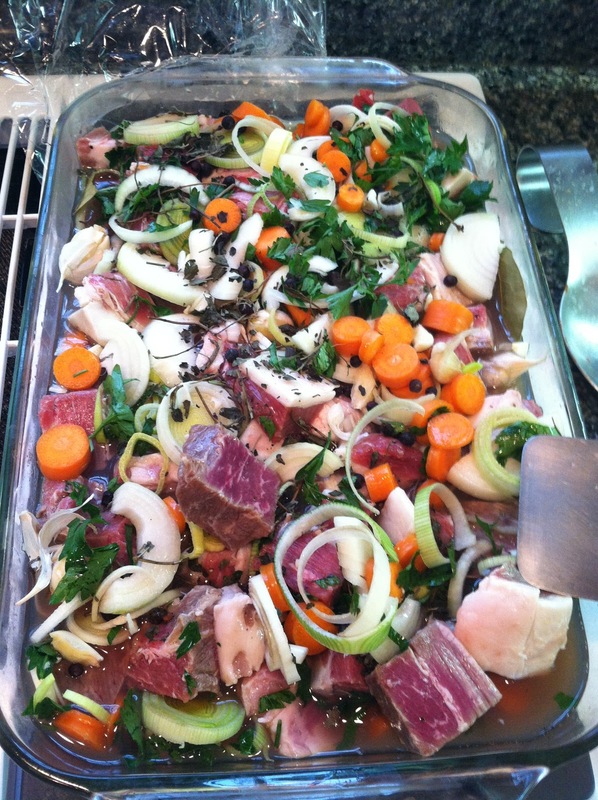 Add the wine, parsley, juniper berries, garlic, bay, carrots, onions, leeks and thyme. 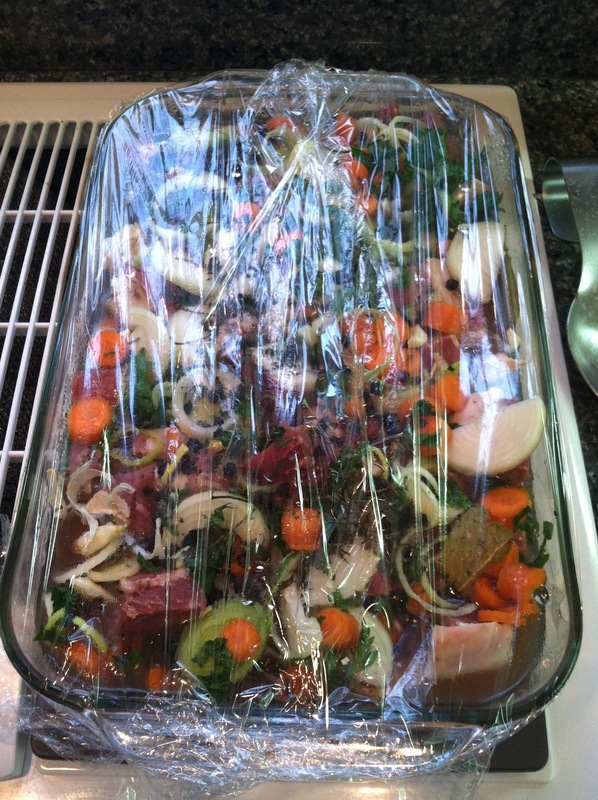 Cover with plastic wrap and refrigerate until day 2. 2. 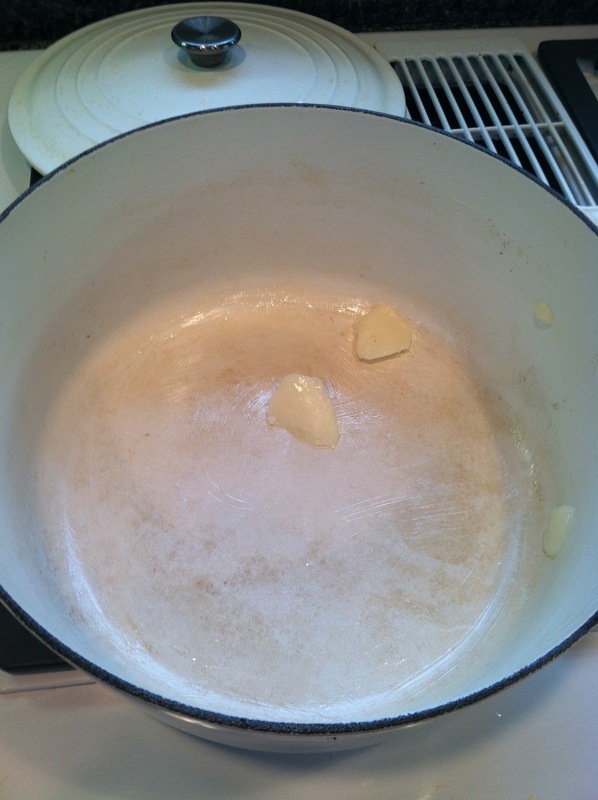 Heat the oven to 350 degrees F. Rub an enameled dutch oven with the duck fat so it has a nice thick coating. 3. 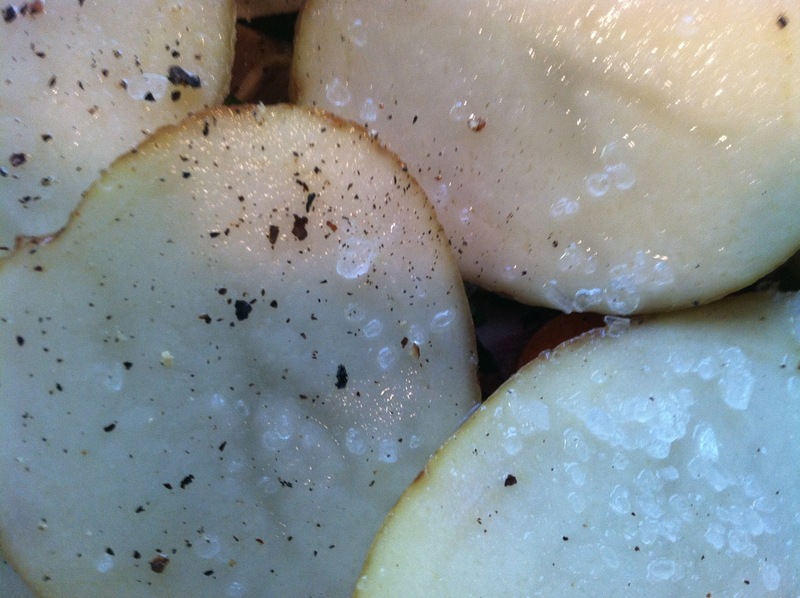 Slice the potatoes into thin slices and layer them with the marinated meat and vegetables, remembering to season in between each layer. 4. 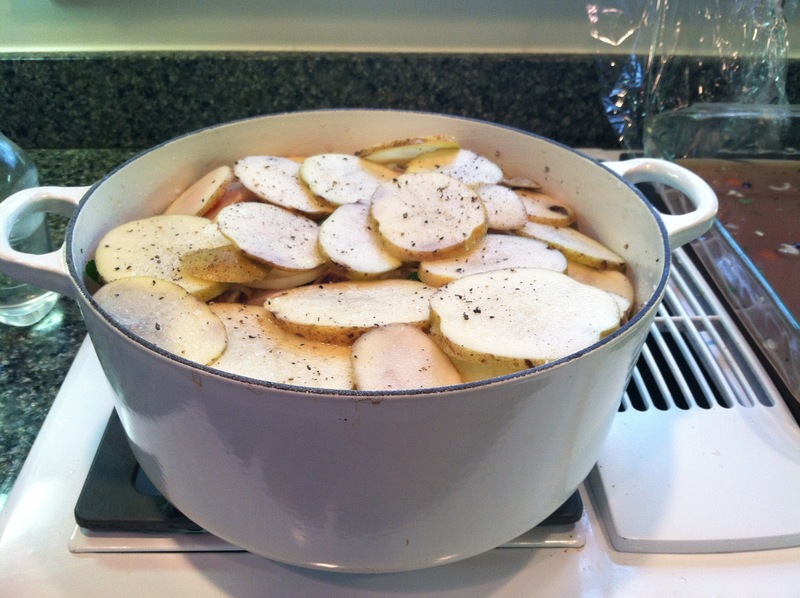 Make sure the last layer is potatoes. 5. Mr. Bread Maiden getting fancy with his photography. 6. 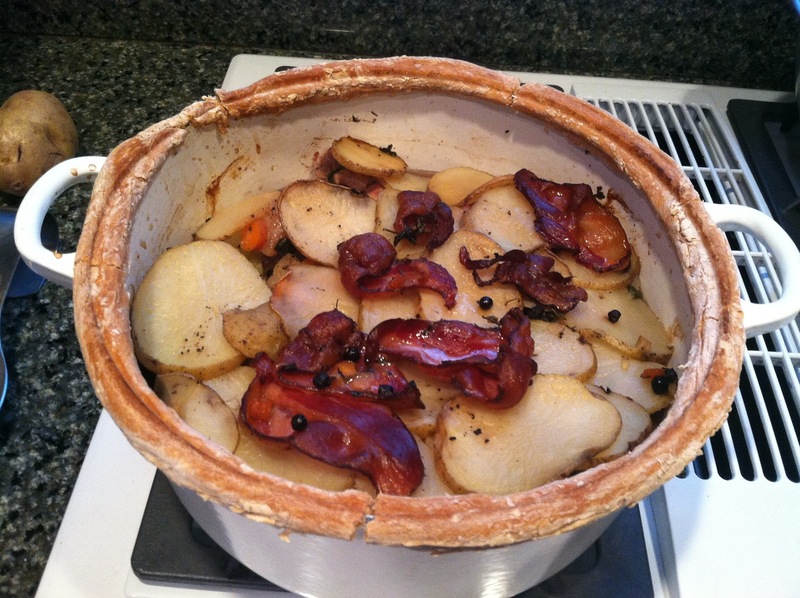 Place your bacon slices on top of the potatoes. Doesn’t that look pretty? 7. 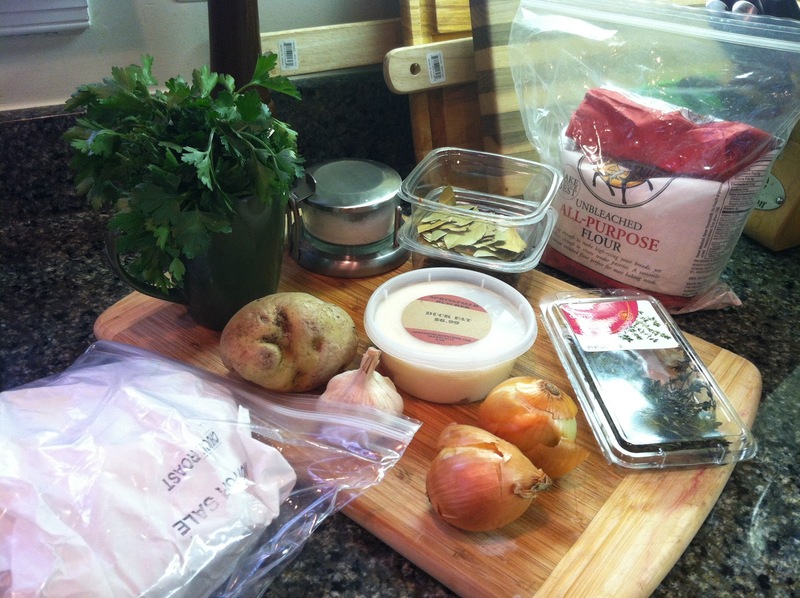 Pour the left-over marinade over the bacon. 8. Now comes the tricky part: making the dough. In a small bowl, add the flour. 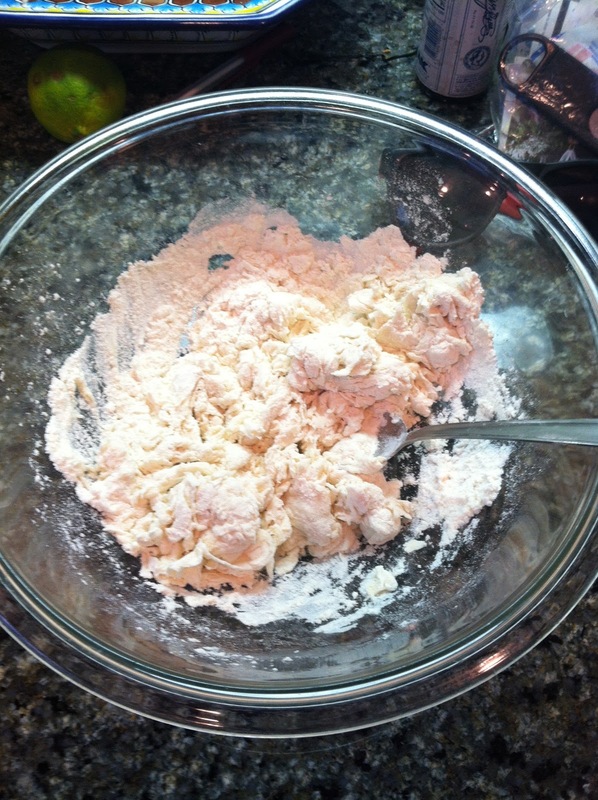 Pour the water over the flour and mix together until it just forms a dough. If it can’t absorb any more flour, don’t force it. 9. When the dough forms a ball, flour a clean surface and knead the dough a little bit. If it’s not malleable, let it rest for about 10 minutes until the dough relaxes. 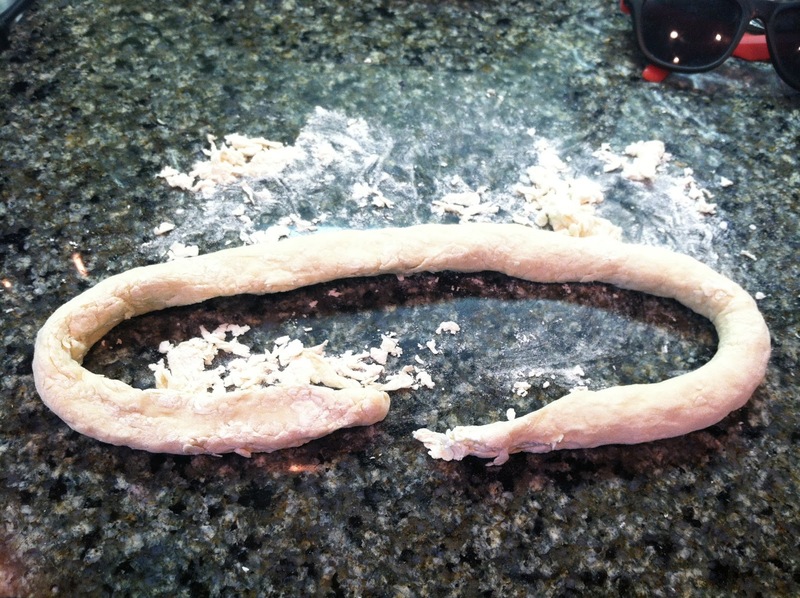 Roll or squeeze the dough into a snake. 10. 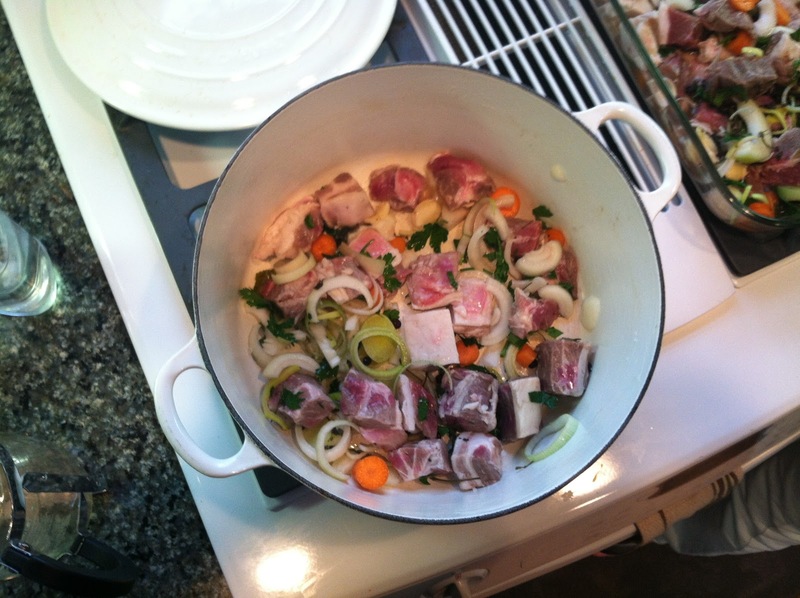 Wrap the dough around the rim of the dutch oven. 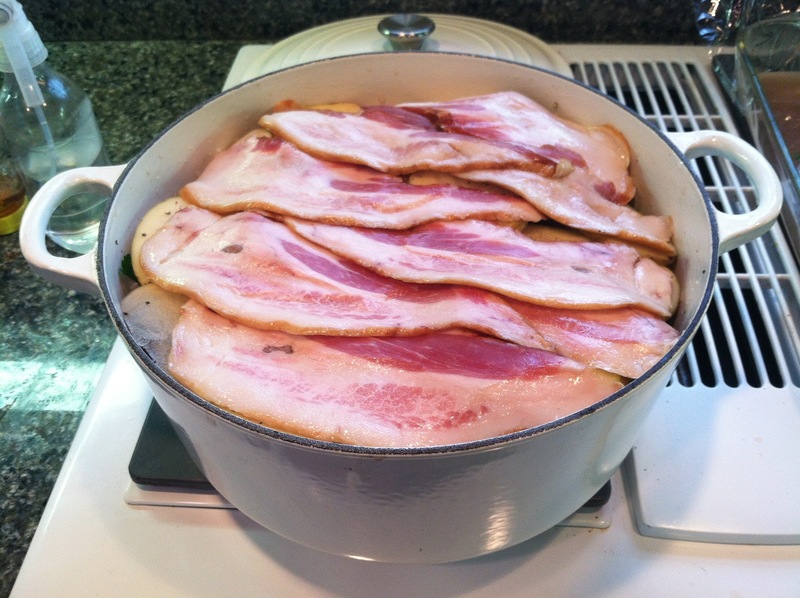 Place the lid on top. 11. Bake in the oven for 3 1/2 hours. 12. 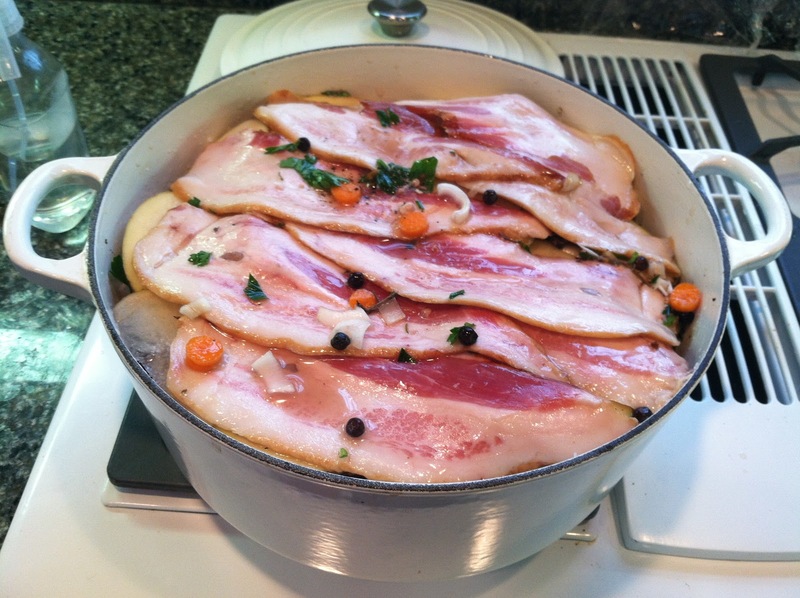 Remove the dutch oven from the oven and let cool for about 10 minutes. 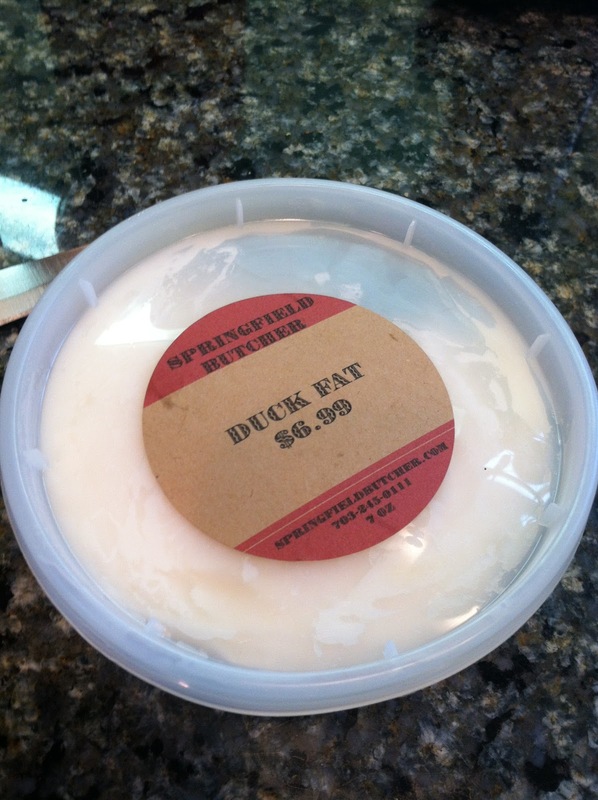 Break the seal using a knife or plastic spatula (if using an enameled dutch oven) if you need to. 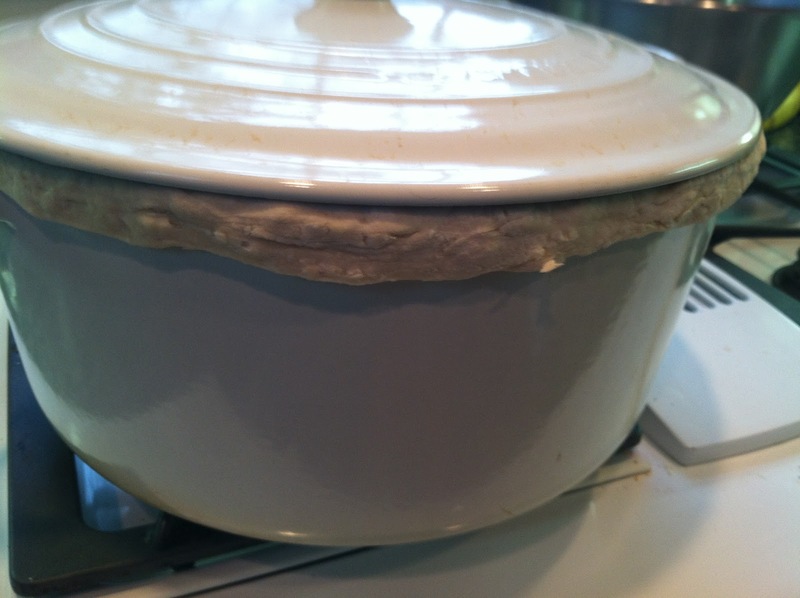 Many recipes said the point of the dough rim was to create a tighter seal akin to a pressure cooker. However, my lid came right off with no resistance. I don’t think it made a difference. We pronounced it quite tasty. I have to say, that looks simply wonderful! The combination of colors and textures is fabulous! It also looks like a LOT! It would probably be a great company dish!